Now, I don’t know about you, but it’s still hard for me to grasp the enormity (and sense) of it. But, then again, the stock market never really does either. After the initial offering, isn’t it just a legalized form of gambling? Aren’t subsequent investors just making a bet? Until we start making decisions on beliefs and values that work for us—the big US—this sort of thing can be expected. Oh sure, we like to dream about being one of the lucky ones who makes it big. But, if we thought about what we—the big WE—could really do with this money, couldn’t we turn this recession and our future around? Alright enough, I’ll get off my soapbox now! Do you want to get on yours? This picture says it all. Hunter Joseph, our 8th grandchild, arrived April 4th with great gusto. Nothing held back, he greets the world full of passion with energy engaging every ounce of his tiny being. I imagine him fully conscious of everything—from the hands of the doctor holding him to the air lightly touching his body—everything is new and exciting. What if we greeted each day in the same way? What would our life and our world look like? What if we experienced the light of dawn each morning and felt the cool air on our bodies as we rolled out of bed as if it were the first time. What if we used this heightened awareness and energy to craft a whole new day, any way we wanted it. Instead of being mired in problems and stuck with obstacles, we’d be poised for each new experience that life hands us. Sure, some we might greet like a lion, but at least we’d be facing them instead of hiding from problems or staying stuck in patterns that no longer work. Life would change for sure. When we face each day with energy and passion we can move forward to build the life we want rather than settle for the life we have. Building is always better than settling into an unconscious way of doing life. Whether it’s unconscious spending, eating or politics as usual, the only way for change is to enter life like a lion. Because if we don’t, the end won’t be going out like lambs but more like sheep going to slaughter. Remember that energy, creativity and curiosity you felt as a child and use it to your advantage every day. And, make it your duty to keep it growing in every child you meet. It’s Money Smart Week, a collaboration of the American Library Association and the Federal Reserve Bank of Chicago. Across the country, free programs have been designed to help consumers better manage their personal finances. And, if you’ve been reading my blog for awhile, I’m sure you can guess my take on the quickest way to become money smart. That’s right—forget about the what, focus on the why. I’m not saying it isn’t important to learn the mechanics of money management, we all need those tips and tools for knowing what to do with our money. But, without knowing if these tips and tools are supported (or rejected) by our beliefs, all the knowledge in the world won’t help us sustain new money behaviors. Only the why can do that. Once we are aware of the beliefs behind our old behaviors we can build new behaviors that really stick. Building awareness begins by opening our senses to what’s really going on. When we make a purchase, put (or take) money in savings or even just think about our finances what do we feel, hear, see deep inside—what is our total sensual experience. 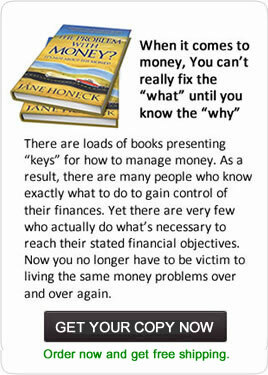 This awareness gives us the clue to the money beliefs driving our financial lives. Once those beliefs become our friend (notice no judgment allowed) we can move on that new money management tip. Because without the why, we’ll only be forcing a next move saddled with unconscious reservations. Real money smart motivation is born with motivation deep in your core, the kind that sticks with you through thick or thin. So, join the rest of the county and raise your awareness from the tip of your toes to the tip of your nose. Trust me; it will be a smart move. Listen to my shtick at the Public Library in Falmouth, Maine: Thursday, April 25 from 6-8 pm. Please enjoy this guest blog by fellow author, Amy Wood. Be back soon! As a psychologist and coach who earns her living from helping people to clarify and cultivate their goals and dreams, I can certainly see that in this age of transformation and reinvention, empty personal improvement rhetoric is one of the most prevalent snake oils on the market. But what I also see is that real wisdom can be found in overblown antidotes if you take them with a grain or two of salt. The solution is not to throw the baby out with the bathwater, so to speak, but to turn self-help hype into real help by applying common sense to the pumped up promises. The hype: The outcome you want will manifest if you envision it. Real help: Imagination alone will not make things happen, but it can definitely help. Picturing a passing grade when you haven’t studied for a test won’t get you very far. But ask any successful athlete and they will tell you that they win more than they lose because they vividly visualize the results they want as they train. If you focus your mind on what you desire AND work hard to bring your goal to fruition, you are more likely to be successful. The hype: You can catapult yourself to the next level by talking ‘as if’ you are already there. Real help: Saying affirmations – telling yourself you are capable and confident in this or that area when you don’t feel that way — will indeed move you steadily where you want to go. But here’s the catch: your affirmations can’t be too big a stretch. If you’re up to your ears in debt, your brain will reject “I am swimming in money” but “My financial decisions are improving” will likely bring about better spending habits. Likewise, “I enjoy moving my body” will be more motivating than “I love working out six days a week” if you’re just decided to get off the couch and exercise. The hype: Positive thinking makes life pain-free. Real help: There is no question that glass-half-full people have it made. It follows that those who complain less than others are more fun to be around and attract better opportunities. But let’s be clear here: optimism will make you more resilient in the face of heartache, disappointment, and failure, but not immune to the curveballs all adults are dealt. Optimism is about taking in the whole picture, embracing the good and the bad, and choosing to focus on what’s going well over what’s wrong. Whether you’re sizing up the economy, the cyberspace dating pool, or a half-baked self improvement suggestion, you’re bound to fare better if you practice a hopeful perspective. While I’m on vacation, I hope you find this guest blog by financial blogger Donna Nell interesting. After the recent financial turmoil of 2008, a large number of Americans are facing an incredible amount of credit card debt. The loads they carry and the trauma they experience may at times become overwhelming. When you’re feeling weighed down by your credit card bills, you might consider employing the services of a non profit debt consolidation company. These organizations are devised to aid consumers in getting out of debt by assisting them in paying off their entire debts in a timely manner and restore damaged credit. When you’re in debt, it’s quite natural for you to feel helpless. 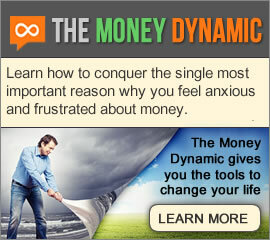 However, there are several ways to resolve your problems and lead you to a path of financial freedom. Times are tough, and you need to save cash for a secured future. Why is it important to save money? For some reasons, individuals have considered saving cash as a tough thing to do. With all the expenditures you have and the stuffs you need to take care of, savings can really get difficult. No matter how difficult it may appear, it’s still an important part of your lives. You simply need to allocate sufficient cash on a daily, monthly, weekly, or yearly basis. A person may save for numerous causes; the most regular reason is to possess a disaster fund in times of changeable circumstances. There are different kinds of savings, such as receiving pension plans or any other type of insurance, putting aside some portions of your cash to a bank, trimming your expenditures, depositing in your personal bank account, and making investments. Once you save, you can do a number of things with your cash. One thing that you can do is to invest on items such as stocks or bonds. You may also use the funds for initiating a business. With savings, you get an assurance of a secure life and constant fiscal growth. Debt management: This could be quite an exclusive debt help procedure. At times, it can be vital to save cash while participating in a debt management method. This is an important step towards a successful debt management procedure. While you’re under a debt management plan, your chief aim is to gradually pay off your liabilities with a purpose to lessen the net amount of your current debts as well. All it requires is to build and implement a planned financial management and spending system that can successfully help you in handling your monthly income and expenditures. A few ways to save while under a debt management plan: There are various ways to save up when you’re under a debt management procedure. All that you need is to have an indomitable mind and perception, knowing what you actually want to get and how you may attain those goals. Keep a track of your expenditures – Make a detailed list of your monthly income and expenditures. Take a look at every item that you’re spending on. Now, locate those areas where you need to trim down your expenses. Know your priorities – Know which debts, bills and costs require your greatest attention. Once you do so, you’re made sure of a planned and structured way of fiscal planning. Cut back on your expenses – Prioritize your unnecessary expenses based on how essential they are to you. Now start trimming the least significant ones. In case you have a gym membership that you utilize occasionally, terminate it. If you hardly watch television, withdraw your cable connection. Intelligent shopping – Avoid buying stuffs that you don’t really require. Also, be cautious of sales, as these are the main reasons behind you losing your money. Even though things are inexpensive, if you don’t require them, don’t purchase them. With some assessment of your financial plan and some quick action, you must be able save money during a debt management program. Once you save a considerable amount of cash, you’ll be able to settle your debts on time. Have you heard that Tide laundry detergent is the hottest thing on the black market. Seems pretty odd to me but it seems the reason why is because it’s relatively expensive(about $10 for a small bottle, $20 for a large one), it doesn’t spoil, you can’t trace it, and it’s the most popular brand of something everybody needs. And, more importantly, it’s relatively easy to resell for a quick profit. Odder still is that the thieves are trading it for drugs on the black market. Kind of takes the idea of money laundering to a whole new level. Transacting a drug deal with a bottle of Tide? It’s true, and it’s happening all over the country. In fact, it was reported that some CVS pharmacies are keeping their Tide in locked glass cases. Next thing you know, we’ll have to show ID to keep our clothes clean. But, what’s the story underneath the story—what’s really going on? I’ve been racking my brain how this all started—who was the first to say, I don’t have money but I have Tide. How long did it take to decide this was a worthy deal? It started me dreaming about what might have happened the first time the concept of money was introduced. Can’t you just picture it? “You want to give me a token for my cow instead of 4 goats? You’ve got to be kidding! ?” But then they were enticed by the idea of what that token could bring and how much better that token would feel in their pocket instead of dragging around 4 goats? Did they start feeling the intrinsic power in that small piece of paper? Is that how money first got its power? Interesting to think about it. But really, if we start trading money for Tide, what’s next? Goats? Does that mean we’re losing faith in the almighty dollar? What do you think? Lots of room to imagine. This morning’s paper had an article about the uprising over ammonia-treated pink slime and the fact that it’s on the menu in many of our nation’s schools. The pile of tiny pink sticks of pseudo-beef filler in the accompanying photo did nothing to quell the uneasy feeling in my gut as I read the article. I don’t think that knot in my stomach was about the foodstuff but rather about the motive behind it. I’m all for efficiency and making the most of a resource but at some point we have to draw the line and recognize that the end-product crosses the line. It’s a perfect example of what happens when we put the almighty dollar before our values. Can’t you just imagine the meeting where the idea for pink slime first came up? Stomachs churn. They continue, “Presto-chango we have something new to sell!” Ears perk up, stomachs settle down and excitement builds as the analyses of future profits from a pile of garbage are presented. Moral compasses are overridden by financial opportunities. Corporate greed trumps individual good. How easy it is to forget the end-user amidst the promise of more corporate dollars. Today’s the day to start using your pink slime filter (previously the sniff test) to get to your core values. If it doesn’t pass, it’s time to stop, re-evaluate and get to the bottom of that pile of pink stuff? An icky journey, but one we must all rise to. Over two years ago I wrote this blog. After a too busy last week and even busier start to this week, I decided to repurpose it in honor of Valentine’s Day – hope you enjoy it! Today is Valentine’s Day; the day to honor love. It got me thinking about how we have been programmed to expect certain things on certain days. There are countless jokes about making the wrong gift decision – or just plain forgetting. The next morning he got up early and left for work. When his wife woke up, she looked out the window and sure enough there was a box gift-wrapped in the middle of the driveway. Confused, the wife put on her robe and ran out to the driveway, brought the box back in the house. She opened it and found a brand new bathroom scale. Yes, it’s funny – but how do jokes like this burrow into our subconscious and influence our gift giving? We’re told the gift should be big and flashy – if we don’t get it right we’re in big trouble. And, for those of us on the receiving end – is it possible to be happy with something less or will “keeping up with Joneses” start us down a path of despair? No wonder so many of us have problems giving and receiving. How do we even know what is important to us when we’ve been fed these messages all of our lives. So next time you’re on the line to either give or receive – take time to think about what really puts value and joy into your life. Don’t buy into the old messages (or the new ones coming your way every day). Make the day your own! So Happy Valentine’s Day. Turn down the volume on your internal messages and make this day a day of loving those intangible things in life. But while doing that, don’t forget to include that very tangible special person!